Looking to find the best beard grooming kit on the market? Beard care and maintenance products are essential if you want to keep your facial hair healthy and growing. But instead of piecing together a combination of quality beard oils, balms, conditioners, brushes, combs and washes, guys can simply buy a good beard kit and get everything they need. 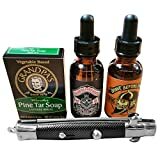 After researching beard maintenance kits from the top brands, here are the best beard care kits to get, starting with the most popular – the Rapid Beard Grooming and Trimming Kit For Men. A good beard will never go out of style, and having the right men’s beard and mustache grooming kit can make all the difference when it comes to maintaining facial hair. Whether you prefer heavy stubble or want to grow a full beard, there are quality beard products that can help you achieve your goals. Check out our reviews of the top beard grooming kits as well as a buying guide to help you pick the right set for you. The Rapid Beard Grooming & Trimming Kit is simple yet sophisticated, containing valuable tools for a very appealing price. As one of the most popular beard kits in the industry, you get stainless steel barber beard scissors for trimming, a boar bristle brush for styling, beard balm to soften, and unscented oil to moisturize. This kit allows you to easily trim, style and groom with quality tools and products that stand above the rest. Rapid Beard products are all-natural and organic, containing ingredients such as vitamin E and Argan oil to not only condition but promote hair growth. Effortlessly perfect your beard style with the boar bristle brush, which allows you to create a sleek, tame look while spreading your hair’s natural oils seamlessly. The leave-in wax or “beard butter” softens and tames your facial hair, allowing your beard to make a masculine statement without the unkempt, dirty look. Along with the beard balm, the bundle’s oil eliminates dandruff and retains moisture. Both of these care products have been developed to help you shape your beard while softening and eliminating itching. As one of the highest-rated beard grooming kits around, this package is the perfect gift for your husband or boyfriend. In addition to its world-class components, the set comes in a luxury premium gift box. 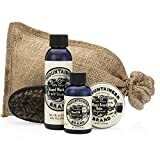 The Beard Care Kit by Mountaineer Brand contains everything a seasoned beard-enthusiast needs to keep their facial hair tame, refined and dapper. This set has a very masculine feel, but the kit contents aim to keep your beard soft and smooth. Included, you’ll find everything a man needs for daily beard maintenance and grooming. For a low price, you get beard balm, oil, wash, and an oval-shaped beard brush. All of the kit’s contents come in a burlap bag, which adds some masculine flair to the grooming kit. Plus, all the products have been manufactured in the US, guaranteeing high-quality ingredients. The Mountaineer Brand is known for its all-natural, effective beard products. This set’s beard oil is considered one of the best on the market, and it works well with the wash to provide constant, effective hydration to your face. The beard wash also contains essentials oils but no harsh chemicals. If you’re suffering from dry, brittle facial hair, then the oil, balm and wash combo offer the ultimate solution. You can choose between two scents – cedarwood and fir needle – and they both pack a tantalizing, woodsy punch. The scents of the Mountaineer products are subtle yet earthy, and the fragrance is derived from a combination of essential oils. The beard balm is available in grapefruit, fir needle, or lime scents, which stay true to the fragrant yet not overpowering theme. This Mountaineer Brand Kit will definitely have your beard looking and feeling its best with a touch of masculine fragrance. Looking for a grooming kit that really delivers on value with quality and quantity? The Beardsley In The Box Beard Care Set delivers full-size, not travel-size, beard care products that put other companies to shame. This beard kit comes with the works, and was put together to give you a clean and soft beard. Made in the USA, this bundle retails for less than $50, but contains the brand’s premium shampoo, conditioner, oil and lotion. Both the Wild Berry Ultra shampoo and Cantaloupe Ultra shampoos are designed specifically for beards and mustaches – making them an everyday grooming essential. The Ultra conditioner leaves your facial hair and skin smooth after every use. The beard oil and lotion are gentle yet effective in keeping your beard soft, subtle, and manageable. The lotion’s cooling scent of Bay Rum relaxes your skin. Although the Beardsley Beard Care Set does not include any brushes or combs, the full-size bottles make up for it. This beard grooming kit covers the two major senses – sight and smell – to take your beard grooming to another level. DapperGanger offers an environmentally-conscious grooming kit that changes the beard trimming game completely. Everything inside the kit, besides the beard balm, is certified vegan and organic, making it the perfect staple to men serious about their beards. With a clear commitment to quality, the company’s beard care set is sold as a “gift pack” because it comes with so many hygiene tools. For starts, you get organic, full-sized bottles of beard balm, oil, and wash. This gift set also includes the proper tools for grooming perfection, such as stainless-steel scissors and a metal beard comb that also serves as a bottle opener. All of the contents come in a convenient canvas travel bag, allowing you to trim your beard effortlessly wherever you go. The nicely made travel bag alone would cost you $10 to $20 online. The combination of the top-notch beard balm and oil will leave your beard looking sleek and kept, and your facial hair will feel unbelievably smooth and soft. The beard balm, oil, and wash contain hints of lemongrass, mint, and rosemary that are subtle yet fragrant – allowing your beard to smell pleasant all day. In the end, the combination of products and organic ingredients will maximize your beard’s growth rate. The DapperGanger Beard Kit works well with sensitive skin and all hair types, keeping your beard growing and looking its best. Because this package pulls out all the stops, we think it’s a great gift for any guy who values their facial hair. The Zeus Deluxe Beard Grooming Kit is all about keeping your facial hair looking stylish and your skin moisturized and healthy. The premium Zeus brand aims to keep your beard hair sleek, smooth, and sophisticated. Zeus approaches beard grooming as an art-form, with a focus on top-notch ingredients and excellent results. While certainly not the cheapest kit on our list, this set contains all the necessary components for the perfect beard. The comprehensive bundle includes a beard shampoo, conditioner, oil, and boar bristle brush to rid your beard of annoying knots and tangles. All of these grooming tools come in a trendy burlap sack. Let’s begin with the Zeus Beard Shampoo and Wash – a specially formulated solution to protect the quality of your hair and skin. It contains antioxidants that keep your facial hair soft and your skin hydrated, working well with all skin types. A key ingredient in the shampoo is Dragon’s Blood, a tree-based substance that reduces skin inflammation. Furthermore, you’ll find green tea and chamomile infused into the wash. Green tea is excellent for preventing dandruff while chamomile works to strengthen hair for a shiny finish. The same special care was given to developing the company’s beard conditioner – a solution that delivers a soft beard, moisturizes skin cells, protects you against beardruff, and prevents split ends. Beard oil adds thickness to your facial hair and prevents unnecessary breakage, allowing you to grow and maintain a healthy, full beard. With all-natural ingredients, guys can choose from three scents of oil: sandalwood, Verbena lime, or vanilla rum. All of these fragrances smell good and fresh, but in a subtle way. Finally, complete your beard care routine by using their boar bristle brush, which is one of the best in the market. The rounded bristles evenly distribute oils all the while untangling hairs and softening the texture. The Zeus Deluxe Beard Grooming Kit sets the standard for beard maintenance and treatment, and is perfect for anyone looking to keep their facial hair looking good all day, every day. Grave Before You Shave is one name you will never forget – and the products in this grooming kit live up to the hype. Any real beardsman should be dedicated to maintaining his beard, and this package provides everything you need to take good care of yours. Affordable and highly-rated, the Grave Before You Shave Beard Care Pack will only set you back $30, but is worth every penny. It contains two bottles of beard oil – in scents Viking Blend and Bay Rum – beard soap for a good wash, and a switchblade beard comb to perfectly style your look. These products definitely don’t skimp on quality, and they work together to effortlessly trim and style your facial hair. The Grave Before You Shave oil keeps your beard smooth, straight and conditioned, allowing you to easily achieve any of your favorite beard styles. It also protects the health of your hair and skin, so your beard can look effortlessly rugged yet stylish without any itchiness. The beard soap is similarly useful for proper hygiene and cleanliness, but doesn’t dry it out. In fact, compared to other bar soaps, this one actually minimizes frizz while conditioning. Lastly, in addition to its functionality, the switchblade comb just looks awesome. This beard care kit is affordable and a great starter set for men. It goes without saying that the Wizard Beard Grooming Care Kit caters to hair textures of all kinds, including coarse, long beards. This bundle beard contains all the essentials for beardsmen who want their facial hair sleek and sophisticated, without sacrificing the quality of their beard or face. Each Beard Wizard pack can be yours for less than $40, and comes with a boar bristle beard brush, static-free comb made of Sandalwood, all-natural oil, and wax formulated with the finest ingredients. Although this beard grooming set doesn’t include wash or conditioner, the beard oil and wax are effective enough to work wonders on their own. The beard oil is all-natural, and contains hair and skin-boosting ingredients such as vitamin E, Aloe Vera and jojoba oil. Then the beard wax incorporates Shea butter, Emu oil, Argan oil, and vitamin E again. Acting as a leave-in conditioner that will soften your beard, these two products will start producing results almost overnight. Guys can then use the boar-bristle brush to distribute these products without irritation or pulling, thereby moisturizing while styling. Similarly, the brand’s well-built, wide-tooth comb can combat even the thickest of beards, allowing you to remove any knots or tangles without damaging your hairs. And with a full money-back guarantee, the Wizard’s set is anything but mediocre, giving you a nicely groomed beard for an impressive price. The no-questions-asked warranty alone makes this bundle worth trying out! With so many different beard care products and brands to choose from, determining which one to get can be confusing. While it’s important to pick a complete kit that offers all the right tools, it’s equally critical that they actually work and provide results. Before you buy a new beard maintenance kit, you should consider a few key factors. Keeping these tips in mind will ensure you are happy with your purchase. Check the ingredients and consider your skin’s sensitivity. Always opt for products with all-natural ingredients, especially if you have sensitive skin. Fortunately, this is a priority for us and the sets we’ve reviewed below are already made with the highest-quality ingredients. In fact, we’re only recommending the best brands with top customer satisfaction ratings. Give the quality of your comb or brush some thought. A good beard brush and comb are absolute requirements, and don’t underestimate their value. Remember, you can’t get rid of tangles and knots with just beard oil and balms, and you’ll always need something to work these products deep into your facial hair. Moisturizing and conditioning is crucial. Purchase a set that emphasizes keeping your beard and skin moisturized and healthy. This means a quality beard shampoo and conditioner as well as oils and balms that aim to prevent itching while maintaining smooth, hydrated skin. Choose your favorite fragrance. To be on the safe side, choose a package that comes with unscented products; otherwise, gamble on what you think your favorite smell may be. All of these brands have carefully crafted unique and manly fragrances. Ultimately, a good beard kit provides the necessary tools to grow and maintain the perfect facial hair. These beard grooming kits are definitely the top picks for any guy growing, styling and maintaining facial hair seriously. If you don’t want to piece together a set and spend even more on individual items, think about one of these exceptional bundles as a starter set. We’re confident you’ll be happy with your purchase and how good your beard will look.